Teazor also known as Ladele Oluwatosin was born in Bauchi city to the family of Mr. and Mrs. Ladele who hail from Ondo and Oyo states respectively in Nigeria. Teazor is the fourth of five children. Teazor’s encounter with music (hip-hop) started with sampling the works of Eminem, Nas, Bob Marley, Fela, Femi Kuti and Sammie Okosun amongst many. Teazor delved into song writing in 2002 when he gained admission into the University of Abuja. He wished to express his art, talent and passion so he featured on and did jobs with hip hop artistes in Nigeria such as Mode 9, Six foot plus, 5 mics etc. He has worked with producers like Go lynx and Phujja. This was the beginning of the manifestation of his dreams. 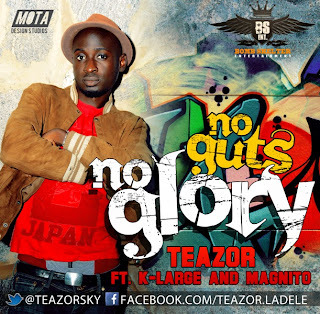 Teazor performed in major hip-hop and R&B shows and concerts in federal capital territory. A self acclaimed philosopher, Teazor presents this attribute in a creative form when he raps. 50 PEOPLE DEAD AND OTHERS MISSING AS TSUNAMI HITS JAPAN.